How can a player get to the next level? Every year thousands of youth hockey players try out for their next season’s teams. Virtually all are trying to “get to the next level.” In Illinois the next level might be AAA, or it might be their club’s Central States or Gold level teams. In some cases it might simply be making that first travel team. But one thing is certain: All these players aspire to improve. That’s what being competitive is all about. And so all these young hockey players will “go for it” and work to improve. They want to be better tomorrow than they were yesterday. Is training in-season with a team enough? In a word - no. And so hockey parents must do whatever they can to support their child’s dreams and aspirations, especially when it comes to making that next-level hockey team. Indeed, most parents will spend a significant amount of money on supplemental hockey training, understanding that the relatively limited amount of in-season training most players receive at practices with their club teams is simply not enough. At least it’s not enough if they expect him to fully realize his potential. What can be done during the off-season? But is all this supplemental hockey training really worth it? Are the various off-season activities worth the investment? The answer of course is … maybe. So let's look at each of these separately. Spring hockey has its advocates and its detractors. It used to be that even the very best players chose not to participate in spring (or summer) hockey. Rather, they “hung up their skates” when the hockey season ended and participated in other sports. 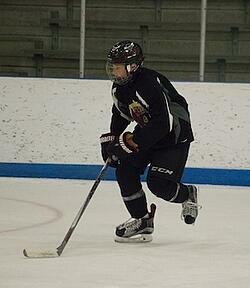 There is no doubt that it can be extremely valuable for a youth hockey player to play other sports. Because, generally speaking, the best athletes make the best hockey players. But nowadays, it is basically “necessary” to participate in your targeted team's spring hockey program. And this is especially true for players trying out for AAA who have never played at the AAA level before. On the positive side, there are a couple of significant benefits that can come from participating in AAA (or high-end AA) spring programs. For one, the overall level of play on the ice will generally be very high, because all or most of the players on the ice are very good youth hockey players. In addition, as a rule the AAA and high-end AA coaches will be high-caliber coaches, very comfortable working with top players. And so the training sessions should be consistently of high quality. 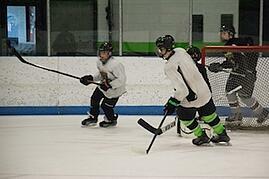 Virtually all summer hockey camps and clinics have at least some value for most of the attendees. Some camps and clinics are of course better than others, most notably those (e.g. 200 x 85) where the coaching staff is strong and offers lots of feedback. much like “cramming” for finals, much of what was taught is soon forgotten. With a quality instructor, private lessons can indeed be valuable. The one-on-one or small group setting allows the instructor to tailor the training to meet the players’ specific needs. keeping the player’s intensity and commitment level up during the training, as it can be counterproductive if the player would have preferred to be elsewhere, e.g. if it was the parent and not the player who insisted on the lessons. Off-season tournament teams can definitely be fun, but they can of course also be expensive. Yet at the same time they also have the potential to be fantastic learning experiences. players have the opportunity to make new friends and also to develop their team-building and leadership skills, i.e. because the group must “become a team” in a very short time-frame. The most important thing about ANY off-season youth hockey developmental program is that it should be challenging for the young player. Most parents understand this and will therefore look to put their child in an environment that will “bring out the best” in him. As long as the program does that, there will be value for the young player. Over the years I coached a lot of spring hockey teams, including 12 springs with the Chicago Mission. I also ran off-season developmental hockey camps and clinics, and gave my share of private lessons. And I have coached dozens of tournament teams, primarily with the Bauer Selects, including many tournament trips to Europe and Canada. And so while I believe there can be significant value in all of these programs, I also believe there is a better way. The bottom line for any youth hockey player hoping to realize his full potential is to develop the proper mindset. And this was the topic of another recent blog, The 7 Keys of a True Hockey Mindset. Open Enrollment for the 2019-20 school year at Bridgedale has already begun. And we continue to accept transfer students into our 5th, 6th and 7th grades for the 2018-19 School Year. 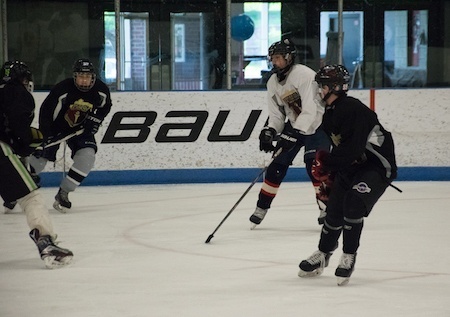 Bridgedale Academy is an all-boys school for athletes, a prep school for serious youth hockey players offering grades 5 through 8 each school year. In addition to our winning combination of sports and academics, we focus on leadership training. We use a classical academic curriculum and our graduates go on to attend some of the most prestigious high schools in the country, including Lake Forest Academy, Culver Military Academy, Shattuck St. Mary’s, Northwood School, Benet Academy, Fenwick Prep, St. Ignatius Prep, Marmion Academy, Latin School and Providence Catholic. We pride ourselves on being the top youth hockey prep school in the nation. Sixteen (16) of our former or current students have already received their NCAA Division 1 college hockey commitments. Three (3) of our graduates competed for USA Hockey’s National Team Development Program. Two (2) now compete for the University of Notre Dame. One just signed his entry-level contract with the NHL New York Islanders. Several Bridgedale grads are now playing junior hockey, including in the USHL, the OHL and the NAHL.